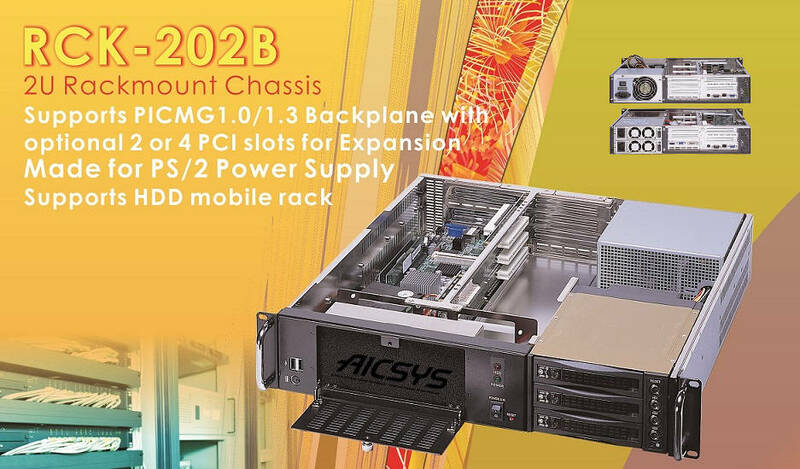 AICSYS, Inc. announces the 2U flexible ruggedized rackmount chassis, the RCK-202B. A 2U short depth Industrial chassis, measuring a depth of only 450mm (17"). RCK-202B provides a perfect flexible solution for system applications which requires a minimum amount of rack space and able to provide high performance in space efficient environment. AICSYS Inc designed RCK-202B to support both PICMG 1.0 or 1.3 Butterfly Backplane and Full-Size SBC, and it is a perfect choice for any Cloud Computing, DVR or network storage and IoT application. Although compact in size RCK-202B can support up to three drive bays, (2) 5.25" or (3) 3.5" internal drives or optional HDD Hotswapable Mobile Rack. Additional I/O expansion can be easily configured through the optional 2 slot (BPE-0502P-2U) or 4-PCI slots (BP-0604P-2U) on the 2U PICMG butterfly backplane. Incorporations of (2) 8cm ball bearing fans ensure excellent airflow ventilation for providing a high performance thermal solution. In addition, removable and washable filter to prevent dust accumulation. Few more attractive features for RCK-202B are the abilities to accommodate PS/2 and Redundant Power Supply; hence, the IPC administrator can choose any type of PS2 power supply from 200W up and more, depends on the administrator’s application. To enhanced extra security, RCK-202B equipped with a lockable front door and easy access (2) 2.0 USB ports and PS/2 connector. Therefore, RCK-202B offers the flexibility and cost saving which no longer limited by space capacity and expansion options. AICSYS Inc is specialized in OEM/ODM for value added services, from simple design to a complete turnkey solutions. We have experienced technicians for consultation.